→From Google page #3 to page #1 and +240% CTR with TextOptimizer! Some search engine optimization tools that can help with this are TextOptimizer and SEMrush. Serpstat is another SEO gem for Text Analytics and Keyword Clustering. So I have decided to share part of my results after using it to help me with Semantic ideas to freshen up some of my existing blog posts. This is an article that has jumped from page 21 (First position on 3rd page) to page 1 of SERPS. A huge leap if you ask me. You now understand why so far it’s gotten +240% improvement in CTR. What I’m going to do is add more topical relevance, make it longer and watch. I won’t build any more backlinks to it yet. Though there is quite big competition from tougher domains, I want to see if Semantics alone will push it further. What it does is it scans your article, makes references to the selected search engine (Now it works with Google and Bing) and then brings you a list of topically relevant keywords to add to your post. I sprinkle some of those words in existing paragraphs. I create additional sub topics and paragraphs using ideas from those proposed words. At the end of it, I get a more complete, long form refreshed content. It should be noted that for the articles I’m working on, I have not added any backlinks recently. These improvements are simply as a result of semantic seo. More about TextOptimizer, click here and let me know what you think. Congrats Enstine! 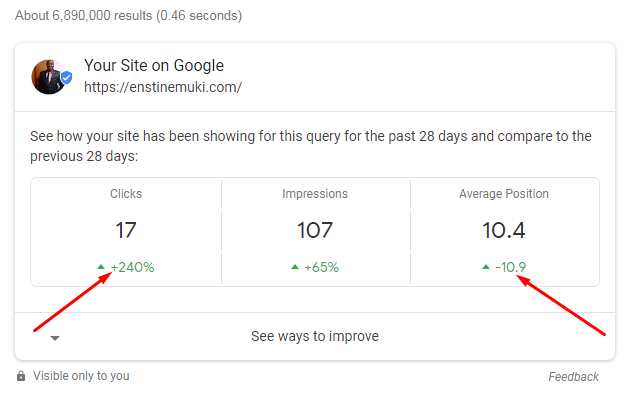 I have noted before; having some sweet and using proper techniques makes a huge difference in SEO. May as well use all the powerful tools in the arsenal to get rocking results like this. Well done! Thanks for sharing your experience, Enstine. I’m going to give TextOptimizer a trial. Congrats Enstine! For having on 1st Page. Some SEO tools are fantastic to grow your website. Also having some sweet and using proper techniques makes a huge difference in SEO. congratulations for having 1st page again. You did great putting hat tool to text and coming out with this incredible result. The semantic keywords suggestions by TextOptimizer are enormous and offers you exciting ideas for to rank your post. Truthfully, I never knew about this tool, but now I do and will give it a try. Your blog is already rocking some decent authority, so it makes sense you’d see a huge jump from making semantic tweaks to a page. Been a crazy busy weekend. I can’t wait to give this a try. Indeed alot is changing and what used to be success are no longer same for SEO than day. Great share, Enstine. It looks like a promising method to optimize existing content and rank for more LSI versions. Instead of stuffing the main keyword, we can add more LSI keywords and make the article better. Thanks Brandon for the comment. Hos is the new week going? Did you give the app a try? Do you have any other results to share? From 3 to 17 clicks with barely 100 impressions is kind of a long shot to prove that anything works… Also, any lasting results? Also, your previous CTR was about 8%, correct? (3 clicks, 38 impressions) and now it’s at about 16% (17 clicks, 107 impressions); that’s a CTR increase of 100%, not 240%. I agree that providing quality content helps rankings and keyword positioning, but we have to take such results with a grain of salt when it comes to so little data, it’s easy to see incredible % jumps for a few clicks. Good to have you on this. This is not a massive volume keyword and no previous results printed. Note that when I began the experiment on this post, this preview wasn’t available. Again, this is the third week testing so we cannot conclude on long term results. However, this improvement after about 14 days is worth mentioning. The point is that adding semantic value to content has some coloration with SERP position. Thanks for telling us text optimizer it has great value nowadays. it makes me very informative. Never heard of the textoptimiser tool. I must say your articles are educative, I love them. About the semantic tool I will try it out.